Thinking of getting a slushy maker to make your own slushies? 7-11 may be the undisputed king of slush drinks with their American icon The Slurpee. But we shouldn’t have to be chained to a convenience store whenever we want a summertime treat. Also, there’s only so many flavors on offer, so there’s not a lot of control as to what sort of flavor you can have for your drink. That’s why there are plenty of at-home slushy making products out there that promise to bring the fun to your kitchen. Some of the reasons why people want to make their own slushy are that they want to use their own ingredients, or make a slushy that isn’t commercially available. For example, if you want a root beer flavored Slurpee, don’t hold your breath. Also, you can get an iced coffee, but at places like Starbucks they are pretty expensive, around $5 or more. If you invested in a way to make them yourself, it wouldn’t take long for a blender to pay for itself. Another reason is the convenience factor. Not having to go out and get one makes it a lot easier to give the go-ahead on having one. If all you have to do is put some ice and a Coke together in a blender, you’re all set. If you want to have blended drinks at your next party, you only have a few options, like using an ordinary blender, which produces mixed results, or investing in a dedicated machine specifically for the purpose of making blended alcoholic drinks. The Slush Mug has been around for ages now, but they haven’t stopped tinkering with their original concept. It still looks the same on the outside, but they keep re-engineering the inner core so that it works better and better. It’s even got a patent pending on it, because it turns the beverage into slush without using harmful plastics. The thing we like most about the Slush Mug, besides the price, is that the outer mug keeps your drink insulated so it doesn’t melt and doesn’t make you race the clock to try and drink your slushy before it melts. The Slushie Express has a pretty unique design, it’s similar to the Magic Bullet in that in will blend your slushy upside-down and you can drink right from the blender, because the blender doubles as a cup. We found that this product works, and produces a good quality slush, but it can be a little bit of a chore to make. It does blend them up quick, but it will take a little trial and error on your part to get the right mix of ingredients. Once you’ve got it down though it should provide you with plenty of slushies, and it’s at a price point that most people can justify. The debate rages on over Slushy Magic and whether or not it works. We initially concluded that it did not work, but after re-evaluating it and taking into consideration the tips from those that said it does work, we made sure to get the cubes really cold before using it. This involved lowering the temperature of the freezer to make sure it was really arctic. Turns out it does work well, but you have to get the cubes ultra cold. If they are just frozen, like a normal ice cube, they will produce mixed results, which is what we first reported on. It now enjoys our Thumbs Up rating. 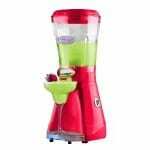 The Margaritaville Blender is in a class by itself, not only in regards to price, but also because of it’s features and how well it works. This is a professional-grade mixing machine that produces stellar mixed drinks like margaritas, daiquiris, mudslides, and even smoothies. You’ll basically be the most popular bartender at the next summertime party you throw. The feature that won us over is the ability for it to make an entire pitcher of margaritas or daiquiris with just the push of a button. Fill the ice bin, add the ingredients into their holder, and hit the start button. Before long you’ve got a perfectly blended pitcher of margaritas to share with your closest friends. When we first took a look at the Nostalgia Electrics Slushy Maker we liked that they were trying to bring back a taste of the 50’s where everyone would visit the local drugstore and get a soda from a soda jerk. However, aside from a sharp design on the outside, they say it’s what’s on the inside that counts, and that’s where the Nostalgia Electrics Slush Maker falls short. Making your own slushy is all about being able to choose what goes into it. 7-11 usually has just a few different flavor options like Coke, Pepsi, Cherry, or maybe a special flavor like Berry Blast or a newly invented flavor like Mountain Dew Code Red when it first came out. You might also get lucky and find something like Pina Colada, or Lemon. When you have your own slushy machine, you get total control of what goes in. With some of the blenders and devices we recommend, you can choose to make all sorts of drinks and treats. You can add iced tea and make an iced tea slushy. You can add a latte, and make a iced latte. You can add Kool Aid which pretty much opens the door to over a dozen different flavors. 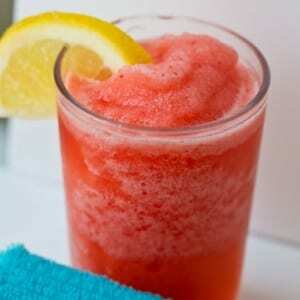 You can make lemonade slushies which are great for the summer. You can even combine iced tea with lemonade for a special treat. There really is no limit to the kinds of drinks you can make, just make sure they contain sugar or natural sweetness so they get that good thick consistency. One of the biggest advantages of going to 7-11 to get your Slurpee is that there’s no mess. So a slushy solution for your home needs to be pretty mess-free. Most of the options that involve using a blender also involve making a mess, because you’ll have to clean up the blender, either by hand or by putting in the dishwasher. Some of the above products don’t involve blending, so they inherently have less parts to clean, and are easier to use. There are products out there that run the gamut on price. 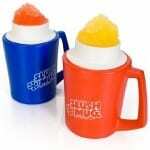 You can get the Slush Mug for around $10 or you can get a Margaritaville blender for $200 or more. It’s not such a big deal how much it costs, because you’ll end up either breaking even or getting more than your money’s worth if you use it regularly. For example, you’d only have to use the Slush Mug a few times for it to be worth it, and you’d only have to throw a few parties in order to make the most out of the more expensive models. If you go with a cheaper model of slushy maker, that doesn’t necessarily mean it won’t work, and if you go with a professional blender, you’re not guaranteed results either, so it shouldn’t be your biggest determining factor. There are two models that have caught our eye and earned our recommendation. We recommend the Slush Mug for non-alcoholic drinks and the closest thing to an at-home Slurpee that you’re going to find. It doesn’t make a mess, doesn’t take long to make, and doesn’t dilute the flavor by making you add ice to it. 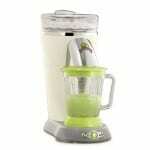 The other model that gets our Thumbs Up is the Margaritaville line of blenders. These basically allow you to turn your home into a fully capable bar, making full pitchers at a time of the most popular blended drinks that everybody loves. So if you’re going to get a slushy maker, make it one of those two.